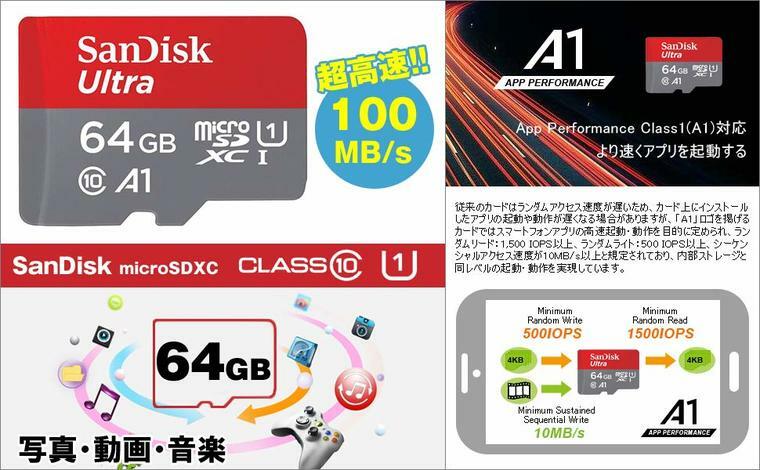 [en] Manufacturer: SanDisk; Type: microSDXC UHS-I card; Capacity: 64 GB; U1 FULL HD compatible application optimization, App performance class 1 (A1) compatible, launch the application faster. With SD adapter dedicated to data transfer * With SD adapter, data transfer is very convenient, it can be used as SD card! There is no support at oversea package goods, domestic manufacturers. Handling of large capacity flash memory: When inserting microSDXC card into non SDXC standard compliant product, data in microSDXC card will be damaged. Also, at that time, SDHC format may be formatted and recognized, but data in the microSDXC card will be corrupted regardless of this operation. Please do not insert it. When dealing with large files (4 GB or more), please check the file size limit by the file system. FAT32: Maximum file size of 4 GB, 4 GB or more files can not be saved. exFAT: It does not correspond to old equipment. Maximum file size of 2 TB, 4 GB or more files can be saved. About recovery of microSD card with damaged data 1) When using the microSDXC card in which saved data is damaged again, it is necessary to plug in the SDXC standard compatible device and initialize microSDXC card . The saved data is deleted. We will not restore data. 2) When inserting the microSDXC card into the product not compliant with the SDXC standard, if the phenomenon that the formware of the microSDXC card is damaged occurs, it can not be repaired even if initialization is performed. * Please measure with the USB 3.0 and UHS-I compatible card reader on the PC with the USB 3.0 interface during the speed test. In order to demonstrate the high-speed performance of UHS-I, not only the card side but also the host (personal computer, camera, card reader, etc.) must also be compatible with UHS-I. For this reason, it is necessary to have a device equipped with USB 3.0 for the speed measurement of the high-speed SD card and a card reader corresponding to USB 3.0 / UHS. Otherwise, you can not get the card's original speed sufficiently. [en] Handling of large capacity flash memory: When inserting microSDHC card into non SDHC standard compliant product, data in microSDHC card will be damaged. Also, at that time, it may be formatted and recognized by the SD standard, but data in the microSDHC card will be corrupted regardless of this operation. Please do not insert it. When dealing with large files (4 GB or more), please check the file size limit by the file system. FAT32: Maximum file size of 4 GB, 4 GB or more files can not be saved. exFAT: It does not correspond to old equipment. Maximum file size of 2 TB, 4 GB or more files can be saved. Manufacturer: SanDisk; Type: microSDHC UHS-I card; Capacity: 32 GB; U1 FULL HD compatible application optimization, App performance Class 1 (A1) compatible, launch the application faster. With SD adapter dedicated to data transfer * With SD adapter, data transfer is very convenient, it can be used as SD card! There is no domestic support in overseas package goods. * Please test the speed as stated on the exhibition page. Also, please check whether your equipment conforms to card specifications. About recovery of the microSD card with damaged data 1) When using the microSDHC card in which the saved data is damaged again, it is necessary to insert the microSDHC card into the SDHC standard compatible device and initialize the microSDHC card . The saved data is deleted. Regarding data, I will not restore it. 2) If you insert a microSDHC card into a product not compliant with the SDHC standard, the phenomenon that the formware of the microSDHC card is damaged occurs, it can not be repaired even if initialization is performed. * Please measure with the USB 3.0 and UHS-I compatible card reader on the PC with the USB 3.0 interface during the speed test. In order to demonstrate the high-speed performance of UHS-I, not only the card side but also the host (personal computer, camera, card reader, etc.) must also be compatible with UHS-I. For this reason, it is necessary to have a device equipped with USB 3.0 for the speed measurement of the high-speed SD card and a card reader corresponding to USB 3.0 / UHS. Otherwise, you can not get the card's original speed sufficiently. 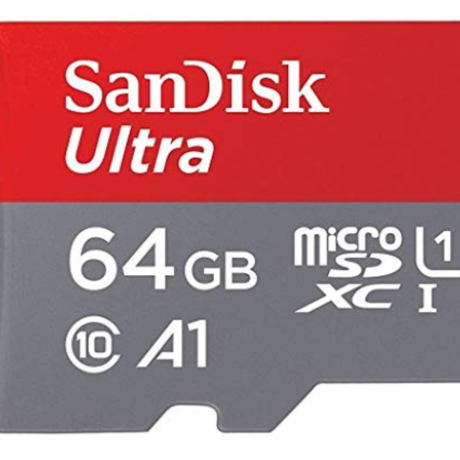 Fabricante: SanDisk; Tipo: tarjeta microSDXC UHS-I; Capacidad: 64 GB; Optimización de la aplicación compatible con U1 FULL HD, compatible con la clase de rendimiento 1 (A1), inicie la aplicación más rápido. Con el adaptador SD dedicado a la transferencia de datos * Con el adaptador SD, la transferencia de datos es muy conveniente, ¡se puede utilizar como tarjeta SD! No hay soporte en productos de paquete de ultramar, fabricantes nacionales. Manejo de memoria flash de gran capacidad: cuando inserte una tarjeta microSDXC en un producto que no sea compatible con el estándar SDXC, se dañarán los datos de la tarjeta microSDXC. Además, en ese momento, se puede formatear y reconocer el formato SDHC, pero los datos en la tarjeta microSDXC se corromperán independientemente de esta operación. Por favor no lo inserte. Al tratar con archivos grandes (4 GB o más), verifique el límite de tamaño de archivo por el sistema de archivos. FAT32: no se pueden guardar archivos con un tamaño máximo de 4 GB, 4 GB o más. exFAT: No corresponde a equipos antiguos. Se puede guardar un tamaño máximo de archivo de 2 TB, 4 GB o más archivos. Acerca de la recuperación de la tarjeta microSD con datos dañados 1) Cuando se usa la tarjeta microSDXC en la que los datos guardados se dañan nuevamente, es necesario conectar el dispositivo compatible con el estándar SDXC e inicializar la tarjeta microSDXC . Se borran los datos guardados. No restauraremos los datos. 2) Al insertar la tarjeta microSDXC en el producto que no cumple con el estándar SDXC, si ocurre el fenómeno de que el formware de la tarjeta microSDXC está dañado, no puede repararse incluso si se realiza la inicialización. * Mida con el lector de tarjetas compatible con USB 3.0 y UHS-I en la PC con la interfaz USB 3.0 durante la prueba de velocidad. Para demostrar el rendimiento de alta velocidad de UHS-I, no solo el lado de la tarjeta sino también el host (computadora personal, cámara, lector de tarjetas, etc.) también deben ser compatibles con UHS-I. Por este motivo, es necesario tener un dispositivo equipado con USB 3.0 para medir la velocidad de la tarjeta SD de alta velocidad y un lector de tarjetas correspondiente a USB 3.0 / UHS. De lo contrario, no puede obtener la velocidad original de la tarjeta lo suficiente. Manufacturer: SanDisk; Type: microSDXC UHS-I card; Capacity: 64 GB; U1 FULL HD compatible application optimization, App performance class 1 (A1) compatible, launch the application faster. With SD adapter dedicated to data transfer * With SD adapter, data transfer is very convenient, it can be used as SD card! There is no support at oversea package goods, domestic manufacturers. Handling of large capacity flash memory: When inserting microSDXC card into non SDXC standard compliant product, data in microSDXC card will be damaged. Also, at that time, SDHC format may be formatted and recognized, but data in the microSDXC card will be corrupted regardless of this operation. Please do not insert it. When dealing with large files (4 GB or more), please check the file size limit by the file system. FAT32: Maximum file size of 4 GB, 4 GB or more files can not be saved. exFAT: It does not correspond to old equipment. Maximum file size of 2 TB, 4 GB or more files can be saved. About recovery of microSD card with damaged data 1) When using the microSDXC card in which saved data is damaged again, it is necessary to plug in the SDXC standard compatible device and initialize microSDXC card . The saved data is deleted. We will not restore data. 2) When inserting the microSDXC card into the product not compliant with the SDXC standard, if the phenomenon that the formware of the microSDXC card is damaged occurs, it can not be repaired even if initialization is performed. * Please measure with the USB 3.0 and UHS-I compatible card reader on the PC with the USB 3.0 interface during the speed test. In order to demonstrate the high-speed performance of UHS-I, not only the card side but also the host (personal computer, camera, card reader, etc.) must also be compatible with UHS-I. For this reason, it is necessary to have a device equipped with USB 3.0 for the speed measurement of the high-speed SD card and a card reader corresponding to USB 3.0 / UHS. Otherwise, you can not get the card's original speed sufficiently. Fabricant: SanDisk; Type: Carte microSDXC UHS-I; Capacité: 64 Go; optimisation de l'application compatible U1 FULL HD, compatibilité de la classe de performance de l'application 1 (A1), lancement plus rapide de l'application. Avec adaptateur SD dédié au transfert de données * Avec l’adaptateur SD, le transfert de données est très pratique, il peut être utilisé comme carte SD! Il n'y a pas de soutien pour les produits d'outre-mer, les fabricants nationaux. Gestion de la mémoire flash de grande capacité: lors de l’insertion de la carte microSDXC dans un produit non conforme à la norme SDXC, les données de la carte microSDXC sont endommagées. De plus, à ce moment-là, le format SDHC peut être formaté et reconnu, mais les données de la carte microSDXC seront corrompues indépendamment de cette opération. S'il vous plaît ne l'insérez pas. Lorsque vous traitez avec des fichiers volumineux (4 Go ou plus), veuillez vérifier la limite de taille de fichier par le système de fichiers. FAT32: la taille de fichier maximale de 4 Go, les fichiers de 4 Go ou plus ne peuvent pas être enregistrés. exFAT: Il ne correspond pas à l'ancien équipement. La taille de fichier maximale de 2 To, 4 Go ou plus de fichiers peuvent être enregistrés. À propos de la récupération de la carte microSD avec des données endommagées 1) Lors de l’utilisation de la carte microSDXC dans laquelle les données enregistrées sont à nouveau endommagées, il est nécessaire de brancher le périphérique compatible SDXC et d’initialiser la carte microSDXC. . Les données enregistrées sont supprimées. Nous ne restaurerons pas les données. 2) Lors de l'insertion de la carte microSDXC dans le produit non conforme à la norme SDXC, si le problème que le coffrage de la carte microSDXC est endommagé se produit, elle ne peut pas être réparée, même si l'initialisation est effectuée. * Veuillez mesurer avec le lecteur de carte compatible USB 3.0 et UHS-I sur le PC doté d'une interface USB 3.0 pendant le test de vitesse. Afin de démontrer les performances UHS-I à haute vitesse, non seulement le côté carte, mais également l'hôte (ordinateur personnel, appareil photo, lecteur de carte, etc.) doit également être compatible avec UHS-I. Pour cette raison, il est nécessaire de disposer d’un appareil équipé de l’USB 3.0 pour la mesure de la vitesse de la carte SD haute vitesse et d’un lecteur de carte correspondant à l’USB 3.0 / UHS. Sinon, vous ne pourrez pas obtenir suffisamment de vitesse initiale de la carte. 제조업체 : 샌 디스크; 유형 : microSDXC UHS-I 카드; 용량 : 64GB; U1 FULL HD 지원 응용 프로그램 최적화, App performance Class 1 (A1) 대응 빠르게 응용 프로그램을 시작한다. 데이터 전송 전용 SD 어댑터 포함 ※ SD 어댑터가 있으면 데이터 전송 편리 SD 카드로 사용할 수 있습니다! 해외 패키지 제품 국내 업체에서 지원하지 않습니다. 대용량 플래시 메모리의 취급에 대해 : microSDXC 카드 SDXC 규격 지원하지 않는 제품에 연결하면 microSDXC 카드의 데이터가 손상됩니다. 또한 그 때 SDHC 규격으로 포맷하고 인식하는 경우가 있습니다 만,이 작업에 관계없이 microSDXC 카드의 데이터가 손상됩니다. 절대로 넣지 마십시오. 큰 파일 (4GB 이상)을 취급 할 때 파일 시스템에서 파일 용량 제한을 확인하십시오. FAT32 : 1 파일의 최대 용량 4GB 4GB 이상의 파일을 저장할 수 없습니다. exFAT : 오래된 기기에 대응하지 않습니다. 1 파일의 최대 용량 2TB 4GB 이상의 파일을 저장할 수 있습니다. 데이터가 손상 된 microSD 카드의 복구에 대해 1) 저장된 데이터가 손상 된 microSDXC 카드를 다시 이용할 경우, SDXC 규격 대응 기기에 연결 microSDXC 카드의 초기화를 실시 할 필요가 오차 있습니다 . 저장되는 데이터는 삭제됩니다. 데이터에 대해서는 복원하지 않습니다. 2) microSDXC 카드 SDXC 규격 지원하지 않는 제품에 연결하면 microSDXC 카드 양식웨어가 손상되는 문제가 발생하는 경우 초기화를 실시하여도 복구 할 수 없습니다. ※ 속도 테스트시 USB3.0 인터페이스 탑재 한 PC에서, USB3.0 및 UHS-I 지원 카드 복구 리더로 측정합니다. UHS-I의 고속 성능을 발휘하기 위해 카드 측뿐만 아니라 호스트 (PC, 카메라, 카드 리더기 등)도 UHS-I를 지원해야합니다. 따라서 고속 SD 카드의 속도 측정에 USB3.0 탑재 한 기기와 USB3.0 / UHS 대응하는 카드 리더가 필요합니다. 아니면 카드 본래의 속도를 충분히 낼 수 없습니다. 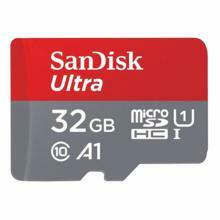 Pengeluar: SanDisk; Jenis: kad microSDXC UHS-I; Kapasiti: 64 GB; U1 FULL HD pengoptimuman aplikasi serasi, kelas prestasi App 1 (A1) serasi, lancarkan aplikasi dengan lebih cepat. Dengan penyesuai SD yang didedikasikan untuk pemindahan data * Dengan penyesuai SD, pemindahan data sangat mudah, ia boleh digunakan sebagai kad SD! Tidak ada sokongan pada barangan pakej luar negeri, pengeluar domestik. Pengendalian memori flash kapasiti besar: Apabila memasukkan kad microSDXC ke dalam produk yang mematuhi piawaian bukan SDXC, data dalam kad microSDXC akan rosak. Juga, pada masa itu, format SDHC boleh diformat dan diakui, tetapi data dalam kad microSDXC akan rosak tanpa mengira operasi ini. Tolong jangan masukkannya. Apabila berurusan dengan fail besar (4 GB atau lebih), sila semak had saiz fail oleh sistem fail. FAT32: Saiz fail maksimum 4 GB, 4 GB atau lebih banyak fail tidak dapat disimpan. exFAT: Ia tidak sesuai dengan peralatan lama. Saiz fail maksimum 2 TB, 4 GB atau lebih banyak fail boleh disimpan. Mengenai pemulihan kad microSD dengan data yang rusak 1) Apabila menggunakan kad microSDXC di mana data yang disimpan rosak sekali lagi, adalah perlu untuk memasangkan peranti serasi standard SDXC dan memulakan kad microSDXC . Data yang disimpan dihapuskan. Kami tidak akan memulihkan data. 2) Apabila memasukkan kad microSDXC ke dalam produk yang tidak mematuhi standard SDXC, jika fenomena bahawa formware kad microSDXC rosak berlaku, ia tidak boleh diperbaiki walaupun inisialisasi dilakukan. * Sila ukur dengan pembaca kad USB 3.0 dan UHS-I yang serasi pada PC dengan antara muka USB 3.0 semasa ujian kelajuan. Untuk menunjukkan prestasi tinggi UHS-I, bukan sahaja sisi kad tetapi juga tuan rumah (komputer peribadi, kamera, pembaca kad, dan sebagainya) juga mesti serasi dengan UHS-I. Atas sebab ini, perlu mempunyai peranti yang dilengkapi dengan USB 3.0 untuk pengukuran laju kad SD berkelajuan tinggi dan pembaca kad sepadan dengan USB 3.0 / UHS. Jika tidak, anda tidak boleh mendapatkan kelajuan asal kad dengan cukup. Nhà sản xuất: SanDisk Loại: thẻ nhớ microSDXC UHS-I, Dung lượng: 64 GB, Tối ưu hóa ứng dụng tương thích U1 FULL HD, Tương thích ứng dụng loại 1 (A1) tương thích, khởi chạy ứng dụng nhanh hơn. Với bộ chuyển đổi SD dành riêng cho truyền dữ liệu * Với bộ chuyển đổi SD, truyền dữ liệu rất thuận tiện, nó có thể được sử dụng làm thẻ SD! Không có hỗ trợ tại các gói hàng hóa nước ngoài, các nhà sản xuất trong nước. Xử lý bộ nhớ flash dung lượng lớn: Khi lắp thẻ microSDXC vào sản phẩm không tuân thủ tiêu chuẩn SDXC, dữ liệu trong thẻ microSDXC sẽ bị hỏng. Ngoài ra, tại thời điểm đó, định dạng SDHC có thể được định dạng và nhận dạng, nhưng dữ liệu trong thẻ microSDXC sẽ bị hỏng bất kể hoạt động này. Xin vui lòng không chèn nó. Khi xử lý các tệp lớn (4 GB trở lên), vui lòng kiểm tra giới hạn kích thước tệp theo hệ thống tệp. FAT32: Không thể lưu kích thước tệp tối đa 4 GB, 4 GB trở lên. exFAT: Nó không tương ứng với các thiết bị cũ. Có thể lưu kích thước tệp tối đa là 2 TB, 4 GB hoặc nhiều tệp hơn. Giới thiệu về khôi phục thẻ microSD với dữ liệu bị hỏng 1) Khi sử dụng thẻ microSDXC trong đó dữ liệu đã lưu bị hỏng một lần nữa, cần phải cắm thiết bị tương thích chuẩn SDXC và khởi tạo thẻ microSDXC . Dữ liệu đã lưu sẽ bị xóa. Chúng tôi sẽ không khôi phục dữ liệu. 2) Khi lắp thẻ microSDXC vào sản phẩm không tuân thủ tiêu chuẩn SDXC, nếu hiện tượng phần mềm của thẻ nhớ microSDXC bị hỏng, nó không thể được sửa chữa ngay cả khi khởi tạo được thực hiện. * Vui lòng đo bằng đầu đọc thẻ tương thích USB 3.0 và UHS-I trên PC với giao diện USB 3.0 trong khi kiểm tra tốc độ. Để chứng minh hiệu suất tốc độ cao của UHS-I, không chỉ phía thẻ mà cả máy chủ (máy tính cá nhân, máy ảnh, đầu đọc thẻ, vv) cũng phải tương thích với UHS-I. Vì lý do này, cần phải có một thiết bị được trang bị USB 3.0 để đo tốc độ của thẻ SD tốc độ cao và đầu đọc thẻ tương ứng với USB 3.0 / UHS. Nếu không, bạn không thể nhận được tốc độ ban đầu của thẻ đầy đủ. Hersteller: SanDisk, Typ: microSDXC UHS-I-Karte, Kapazität: 64 GB, U1 FULL HD-kompatible Anwendungsoptimierung, App-Leistungsklasse 1 (A1) kompatibel, starten Sie die Anwendung schneller. Mit SD-Adapter für die Datenübertragung * Mit SD-Adapter ist die Datenübertragung sehr bequem, es kann als SD-Karte verwendet werden! Es gibt keine Unterstützung bei ausländischen Paketgütern, inländischen Herstellern. Handhabung von Flash-Speicher mit großer Kapazität: Wenn Sie eine microSDXC-Karte in ein nicht SDXC-kompatibles Produkt einlegen, werden die Daten auf der microSDXC-Karte beschädigt. Außerdem kann zu dieser Zeit das SDHC-Format formatiert und erkannt werden, aber die Daten auf der microSDXC-Karte werden ungeachtet dieses Vorgangs beschädigt. Bitte füge es nicht ein. Wenn Sie mit großen Dateien (4 GB oder mehr) arbeiten, überprüfen Sie bitte die Dateigröße durch das Dateisystem. FAT32: Maximale Dateigröße von 4 GB, 4 GB oder mehr Dateien kann nicht gespeichert werden. exFAT: Es entspricht nicht altem Equipment. Maximale Dateigröße von 2 TB, 4 GB oder mehr Dateien kann gespeichert werden. Informationen zur Wiederherstellung einer microSD-Karte mit beschädigten Daten 1) Wenn Sie die microSDXC-Karte verwenden, auf der die gespeicherten Daten erneut beschädigt sind, müssen Sie das SDXC-kompatible Standardgerät anschließen und die microSDXC-Karte initialisieren . Die gespeicherten Daten werden gelöscht. Wir werden keine Daten wiederherstellen. 2) Wenn die microSDXC-Karte in das Produkt eingesetzt wird, das nicht dem SDXC-Standard entspricht, kann das Problem, dass die Formware der microSDXC-Karte beschädigt ist, nicht repariert werden, selbst wenn die Initialisierung durchgeführt wird. * Bitte messen Sie mit dem USB 3.0 und UHS-I kompatiblen Kartenleser am PC mit der USB 3.0 Schnittstelle während des Geschwindigkeitstests. Um die Hochgeschwindigkeitsleistung von UHS-I zu demonstrieren, muss nicht nur die Kartenseite, sondern auch der Host (Personal Computer, Kamera, Kartenleser, etc.) mit UHS-I kompatibel sein. Aus diesem Grund ist ein Gerät mit USB 3.0 für die Geschwindigkeitsmessung der High-Speed-SD-Karte und ein Kartenleser entsprechend USB 3.0 / UHS erforderlich. Andernfalls können Sie die ursprüngliche Geschwindigkeit der Karte nicht ausreichend erhalten. 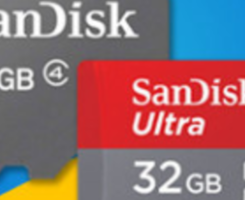 Produttore: SanDisk; Tipo: microSDXC UHS-I card; Capacità: 64 GB; Ottimizzazione dell'applicazione compatibile U1 FULL HD, compatibile con App Performance Class 1 (A1), lancia l'applicazione più velocemente. Con adattatore SD dedicato al trasferimento dati * Con l'adattatore SD, il trasferimento dei dati è molto conveniente, può essere utilizzato come scheda SD! Non vi è alcun supporto per i pacchi merci all'estero, i produttori nazionali. Gestione della memoria flash ad alta capacità: quando si inserisce la scheda microSDXC in un prodotto non conforme allo standard SDXC, i dati nella scheda microSDXC verranno danneggiati. Inoltre, in quel momento, il formato SDHC potrebbe essere formattato e riconosciuto, ma i dati nella scheda microSDXC saranno danneggiati indipendentemente da questa operazione. Si prega di non inserirlo. Quando si gestiscono file di grandi dimensioni (4 GB o più), controllare il limite di dimensioni del file dal file system. FAT32: non è possibile salvare le dimensioni massime dei file di 4 GB, 4 GB o più. exFAT: non corrisponde alle vecchie apparecchiature. È possibile salvare le dimensioni massime del file di 2 TB, 4 GB o più file. Informazioni sul ripristino della scheda microSD con dati danneggiati 1) Quando si utilizza la scheda microSDXC in cui i dati salvati sono nuovamente danneggiati, è necessario collegare il dispositivo compatibile standard SDXC e inizializzare la scheda microSDXC . I dati salvati vengono cancellati. Non ripristineremo i dati. 2) Quando si inserisce la scheda microSDXC nel prodotto non conforme allo standard SDXC, se si verifica il fenomeno che il formware della scheda microSDXC è danneggiato, non può essere riparato anche se viene eseguita l'inizializzazione. * Si prega di misurare con il lettore di schede USB 3.0 e UHS-I compatibile con il PC con l'interfaccia USB 3.0 durante il test di velocità. Per dimostrare le prestazioni ad alta velocità di UHS-I, non solo il lato della scheda, ma anche l'host (personal computer, fotocamera, lettore di schede, ecc.) Devono essere compatibili con UHS-I. Per questo motivo, è necessario disporre di un dispositivo dotato di USB 3.0 per la misurazione della velocità della scheda SD ad alta velocità e di un lettore di schede corrispondente a USB 3.0 / UHS. Altrimenti, non è possibile ottenere la velocità originale della scheda sufficientemente. Fabricante: SanDisk; Tipo: Cartão microSDXC UHS-I; Capacidade: 64 GB; Otimização de aplicativos compatível com U1 FULL HD, Compatível com a classe de desempenho 1 (A1), inicie o aplicativo mais rapidamente. Com adaptador SD dedicado à transferência de dados * Com adaptador SD, a transferência de dados é muito conveniente, pode ser usado como cartão SD! Não há suporte em produtos de embalagem no exterior, fabricantes nacionais. Manuseio de memória flash de grande capacidade: Ao inserir o cartão microSDXC em um produto não compatível com o padrão SDXC, os dados no cartão microSDXC serão danificados. Além disso, nesse momento, o formato SDHC pode ser formatado e reconhecido, mas os dados no cartão microSDXC serão corrompidos, independentemente desta operação. Por favor não insira. Ao lidar com arquivos grandes (4 GB ou mais), verifique o limite de tamanho do arquivo pelo sistema de arquivos. FAT32: Tamanho máximo de arquivo de 4 GB, 4 GB ou mais arquivos não podem ser salvos. exFAT: Não corresponde a equipamento antigo. Tamanho máximo de arquivo de 2 TB, 4 GB ou mais arquivos podem ser salvos. Acerca da recuperação do cartão microSD com dados danificados 1) Quando utilizar o cartão microSDXC no qual os dados guardados são danificados novamente, é necessário ligar o dispositivo compatível com o padrão SDXC e inicializar o cartão microSDXC . Os dados salvos são excluídos. Nós não vamos restaurar os dados. 2) Ao inserir o cartão microSDXC no produto não compatível com o padrão SDXC, se ocorrer o fenômeno de que o formware do cartão microSDXC esteja danificado, ele não poderá ser reparado mesmo se a inicialização for realizada. * Por favor, meça com o leitor de cartão compatível com USB 3.0 e UHS-I no PC com a interface USB 3.0 durante o teste de velocidade. Para demonstrar o desempenho em alta velocidade do UHS-I, não apenas o lado do cartão, mas também o host (computador pessoal, câmera, leitor de cartões, etc.) também devem ser compatíveis com o UHS-I. Por este motivo, é necessário ter um dispositivo equipado com USB 3.0 para a medição de velocidade do cartão SD de alta velocidade e um leitor de cartão correspondente ao USB 3.0 / UHS. Caso contrário, você não poderá obter a velocidade original do cartão o suficiente. Producent: SanDisk; Typ: karta microSDXC UHS-I; Pojemność: 64 GB; Optymalizacja aplikacji zgodna z U1 FULL HD, zgodna z klasą wydajności aplikacji 1 (A1), szybsze uruchamianie aplikacji. Z adapterem SD dedykowanym do przesyłania danych * Z kartą SD, transfer danych jest bardzo wygodny, może być użyty jako karta SD! Nie ma wsparcia na rzecz produktów zamorskich, producentów krajowych. Obsługa pamięci flash o dużej pojemności: Po włożeniu karty microSDXC do niezgodnego ze standardem SDXC produktu, dane na karcie microSDXC zostaną uszkodzone. Również w tym czasie format SDHC może być sformatowany i rozpoznany, ale dane na karcie microSDXC zostaną uszkodzone niezależnie od tej operacji. Proszę nie wkładaj go. W przypadku dużych plików (4 GB lub więcej), sprawdź limit rozmiaru pliku przez system plików. FAT32: Maksymalny rozmiar pliku 4 GB, 4 GB lub więcej plików nie może zostać zapisany. exFAT: Nie odpowiada starym sprzętom. Maksymalny rozmiar pliku 2 TB, 4 GB lub więcej można zapisać. O odzyskiwaniu karty microSD z uszkodzonymi danymi 1) Podczas korzystania z karty microSDXC, w której zapisane dane są ponownie uszkodzone, konieczne jest podłączenie standardowego urządzenia zgodnego ze standardem SDXC i zainicjowanie karty microSDXC . Zapisane dane zostaną usunięte. Nie będziemy przywracać danych. 2) Po włożeniu karty microSDXC do produktu niezgodnego ze standardem SDXC, jeśli występuje zjawisko, że formaterstwo karty microSDXC jest uszkodzone, nie można go naprawić nawet po przeprowadzeniu inicjalizacji. * Dokonuj pomiarów za pomocą czytnika kart zgodnego ze standardem USB 3.0 i UHS-I na komputerze z interfejsem USB 3.0 podczas testu prędkości. Aby zademonstrować wysoką wydajność UHS-I, nie tylko strona karty, ale także host (komputer osobisty, kamera, czytnik kart itp.) Musi być również kompatybilna z UHS-I. Z tego powodu konieczne jest posiadanie urządzenia wyposażonego w USB 3.0 do pomiaru prędkości karty SD o dużej prędkości i czytnika kart zgodnego z USB 3.0 / UHS. W przeciwnym razie nie można uzyskać wystarczającej prędkości oryginalnej karty. الصانع: SanDisk ؛ النوع: بطاقة microSDXC UHS-I ؛ السعة: 64 جيجابايت ؛ U1 FULL HD التطبيق الأمثل الأمثل ، فئة أداء التطبيق 1 (A1) متوافق ، إطلاق التطبيق بشكل أسرع. مع محول SD مخصص لنقل البيانات * مع محول SD ، ونقل البيانات مريحة للغاية ، ويمكن استخدامه كبطاقة SD! لا يوجد دعم في السلع حزمة الخارج ، الشركات المصنعة المحلية. التعامل مع ذاكرة فلاش ذات سعة كبيرة: عند إدخال بطاقة microSDXC في منتج متوافق مع SDXC ، فإن البيانات الموجودة في بطاقة microSDXC سوف تتلف. أيضًا ، في ذلك الوقت ، قد يتم تنسيق تنسيق SDHC والتعرف عليه ، ولكن البيانات الموجودة في بطاقة microSDXC ستكون تالفة بغض النظر عن هذه العملية. يرجى عدم إدخالها. عند التعامل مع الملفات الكبيرة (4 جيجابايت أو أكثر) ، يرجى التحقق من حد حجم الملف بواسطة نظام الملفات. FAT32: لا يمكن حفظ الحد الأقصى لحجم الملف البالغ 4 جيجابايت ، أو 4 غيغابايت أو أكثر. exFAT: لا يتوافق مع المعدات القديمة. يمكن حفظ الحد الأقصى لحجم الملف من 2 تيرابايت ، 4 غيغابايت أو أكثر من الملفات. حول استعادة بطاقة microSD مع البيانات التالفة 1) عند استخدام بطاقة microSDXC التي تضررت فيها البيانات المحفوظة مرة أخرى ، فمن الضروري توصيل الجهاز القياسي المتوافق مع SDXC وتهيئة بطاقة microSDXC . يتم حذف البيانات المحفوظة. لن نقوم باستعادة البيانات. 2) عند إدخال بطاقة microSDXC في المنتج غير متوافق مع معيار SDXC ، في حالة حدوث الظاهرة التي تتعرض لها برامج تهيئة بطاقة microSDXC ، لا يمكن إصلاحها حتى في حالة إجراء التهيئة. * يرجى القياس باستخدام قارء بطاقة متوافق مع USB 3.0 و UHS-I على الكمبيوتر الشخصي مع واجهة USB 3.0 أثناء اختبار السرعة. من أجل إظهار الأداء العالي السرعة لـ UHS-I ، يجب ألا يكون جانب البطاقة فقط ولكن أيضًا المضيف (الكمبيوتر الشخصي ، الكاميرا ، قارئ البطاقات ، إلخ) متوافقًا مع UHS-I. لهذا السبب ، من الضروري وجود جهاز مجهز بـ USB 3.0 لقياس سرعة بطاقة SD عالية السرعة وقارئ بطاقة يتوافق مع USB 3.0 / UHS. خلاف ذلك ، لا يمكنك الحصول على سرعة البطاقة الأصلية بما فيه الكفاية. Tillverkare: SanDisk; Typ: microSDXC UHS-I-kort; Kapacitet: 64 GB; U1 FULL HD-kompatibel programoptimering, App Performance Class 1 (A1) kompatibel, starta programmet snabbare. Med SD-adapter dedikerad till dataöverföring * Med SD-adapter är dataöverföring mycket bekvämt, det kan användas som SD-kort! Det finns inget stöd på övervaka paketvaror, hushållstillverkare. Hantering av storkapacitets flashminne: När du sätter i microSDXC-kort i en icke-SDXC-kompatibel produkt, kommer data i microSDXC-kortet att skadas. På den tiden kan SDHC-formatet formateras och erkännas, men data i microSDXC-kortet kommer att skadas oavsett denna operation. Vänligen sätt inte in den. Vid hantering av stora filer (4 GB eller mer), kontrollera filstorleksgränsen av filsystemet. FAT32: Maximal filstorlek på 4 GB, 4 GB eller flera filer kan inte sparas. exFAT: Det motsvarar inte gammal utrustning. Maximal filstorlek på 2 TB, 4 GB eller flera filer kan sparas. Om återvinning av microSD-kort med skadade data 1) När du använder microSDXC-kortet där sparade data är skadade igen måste du ansluta den kompatibla SDXC-standarden och initiera microSDXC-kortet . Den sparade data raderas. Vi återställer inte data. 2) När du sätter in microSDXC-kortet i produkten som inte överensstämmer med SDXC-standarden, om det fenomen som microSDXC-kortets formware skadas uppstår, kan det inte repareras, även om initialiseringen utförs. * Vänligen mäta med USB 3.0 och UHS-I-kompatibel kortläsare på datorn med USB 3.0-gränssnittet under hastighetsprovet. För att visa UHS-I: s höghastighetsprestanda måste inte bara kortsidan utan även värden (persondator, kamera, kortläsare, etc.) vara kompatibel med UHS-I. Av denna anledning är det nödvändigt att ha en enhet utrustad med USB 3.0 för hastighetsmätning av höghastighets SD-kortet och en kortläsare som motsvarar USB 3.0 / UHS. Annars kan du inte få kortets ursprungliga hastighet tillräckligt. 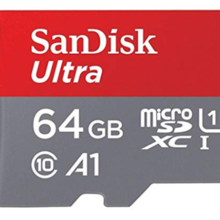 Produsent: SanDisk; Type: microSDXC UHS-I-kort; Kapasitet: 64 GB; U1 FULL HD-kompatibel programoptimalisering, App Performance Class 1 (A1) kompatibel, start programmet raskere. Med SD-adapter dedikert til dataoverføring * Med SD-adapter, dataoverføring er veldig praktisk, det kan brukes som SD-kort! Det er ingen støtte på oversea pakkevarer, innenlandske produsenter. Håndtering av storkapasitets flashminne: Når du setter inn microSDXC-kort i ikke-SDXC-kompatibelt produkt, blir data i microSDXC-kortet skadet. På den tiden kan SDHC-formatet også formateres og gjenkjennes, men data i microSDXC-kortet vil bli ødelagt uavhengig av denne operasjonen. Vennligst ikke sett den inn. Når du arbeider med store filer (4 GB eller mer), må du kontrollere filstørrelsesgrensen av filsystemet. FAT32: Maksimal filstørrelse på 4 GB, 4 GB eller flere filer kan ikke lagres. exFAT: Det samsvarer ikke med gammelt utstyr. Maksimal filstørrelse på 2 TB, 4 GB eller flere filer kan lagres. Om gjenoppretting av microSD-kort med skadede data 1) Når du bruker microSDXC-kortet der lagrede data er skadet igjen, er det nødvendig å koble til SDXC-standardkompatibel enhet og initialisere microSDXC-kort . De lagrede dataene slettes. Vi gjenoppretter ikke data. 2) Når du setter inn microSDXC-kortet i produktet som ikke er i samsvar med SDXC-standarden, hvis fenomenet som formware av microSDXC-kortet er skadet, kan det ikke repareres selv om initialiseringen utføres. * Vennligst måle med USB 3.0 og UHS-I-kompatibel kortleser på PCen med USB 3.0-grensesnittet under hastighetsprøven. For å demonstrere høyhastighetsytelsen til UHS-I må ikke bare kortsiden, men også verten (personlig datamaskin, kamera, kortleser, etc.) også være kompatibel med UHS-I. Av denne grunn er det nødvendig å ha en enhet utstyrt med USB 3.0 for hastighetsmåling av høyhastighets SD-kort og en kortleser som svarer til USB 3.0 / UHS. Ellers kan du ikke få kortets originale hastighet tilstrekkelig. Производитель: SanDisk; Тип: карта microSDXC UHS-I; Емкость: 64 ГБ; Оптимизация приложений, совместимая с U1 FULL HD, совместимость с классом производительности приложений 1 (A1), быстрее запускает приложение. С адаптером SD, предназначенным для передачи данных * С адаптером SD передача данных очень удобна, его можно использовать в качестве SD-карты! Нет поддержки в зарубежных продуктах упаковки, отечественных производителях. Обработка флэш-памяти большой емкости: при вставке карты microSDXC в совместимый со стандартом SDXC продукт данные на карте microSDXC будут повреждены. Кроме того, в то время формат SDHC может быть отформатирован и распознан, но данные на карте microSDXC будут повреждены независимо от этой операции. Пожалуйста, не вставляйте его. При работе с большими файлами (4 ГБ и более), пожалуйста, проверьте размер файла файловой системы. FAT32: Максимальный размер файла 4 ГБ, 4 ГБ и более файлов не может быть сохранен. exFAT: Он не соответствует старому оборудованию. Максимальный размер файла 2 ТБ, 4 ГБ или более файлов может быть сохранен. О восстановлении карты microSD с поврежденными данными 1) При использовании карты microSDXC, в которой сохраненные данные снова повреждены, необходимо подключить стандартное совместимое устройство SDXC и инициализировать карту microSDXC , Сохраненные данные удаляются. Мы не будем восстанавливать данные. 2) При вставке карты microSDXC в продукт, не соответствующий стандарту SDXC, если происходит повреждение формы программного обеспечения карты microSDXC, ее нельзя восстановить даже при выполнении инициализации. * Измерьте с помощью USB 3.0 и совместимого с UHS-I кард-ридера на ПК с интерфейсом USB 3.0 во время теста скорости. Чтобы продемонстрировать высокоскоростную работу UHS-I, не только карта, но и хост (персональный компьютер, камера, кард-ридер и т. Д.) Также должны быть совместимы с UHS-I. По этой причине необходимо иметь устройство, оснащенное USB 3.0 для измерения скорости высокоскоростной SD-карты и устройства чтения карт памяти, соответствующего USB 3.0 / UHS. В противном случае вы не сможете получить исходную скорость карты достаточно. 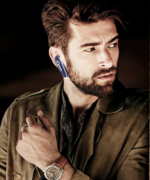 Producent: SanDisk; Type: microSDXC UHS-I-kort; Kapacitet: 64 GB; U1 FULL HD kompatibel applikationsoptimering, App Performance Class 1 (A1) kompatibel, start applikationen hurtigere. Med SD-adapter dedikeret til dataoverførsel * Med SD-adapter er dataoverførsel meget praktisk, den kan bruges som SD-kort! Der er ingen støtte til oversea pakkevarer, indenlandske producenter. Håndtering af stor kapacitet flash-hukommelse: Når du indsætter microSDXC-kort i ikke-SDXC-kompatibelt produkt, vil data i microSDXC-kortet blive beskadiget. Også på det tidspunkt kan SDHC-format formateres og genkendes, men data i microSDXC-kortet bliver ødelagt uanset denne operation. Indsæt det ikke. Ved behandling af store filer (4 GB eller mere), skal du kontrollere filstørrelsesgrænsen ved filsystemet. FAT32: Maksimal filstørrelse på 4 GB, 4 GB eller flere filer kan ikke gemmes. exFAT: Det svarer ikke til gammelt udstyr. Maksimal filstørrelse på 2 TB, 4 GB eller flere filer kan gemmes. Om genopretning af microSD-kort med beskadigede data 1) Når du bruger microSDXC-kortet, hvor gemte data er beskadiget igen, er det nødvendigt at tilslutte SDXC-standarden kompatibel enhed og initialisere microSDXC-kort . De gemte data slettes. Vi gendanner ikke data. 2) Når microSDXC-kortet indsættes i produktet, der ikke overholder SDXC-standarden, hvis fænomenet, der formaterer microSDXC-kortet, er beskadiget, kan det ikke repareres, selvom initialiseringen udføres. * Mål venligst med USB 3.0 og UHS-I-kompatibel kortlæser på pc'en med USB 3.0-grænsefladen under hastighedsprøven. For at demonstrere UHS-I's højhastighedseffektivitet skal ikke kun kortsiden, men også værten (pc, kamera, kortlæser osv.) Også være kompatibel med UHS-I. Af denne grund er det nødvendigt at have en enhed udstyret med USB 3.0 til hastighedsmåling af højhastigheds SD-kortet og en kortlæser, der svarer til USB 3.0 / UHS. Ellers kan du ikke få kortets originale hastighed tilstrækkeligt.